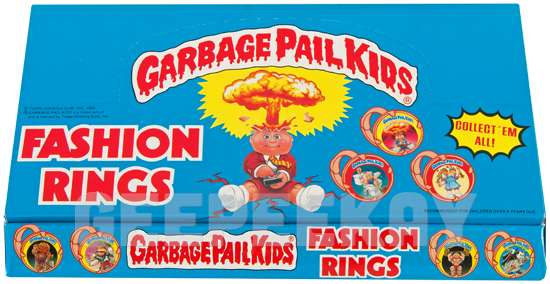 Fashion Rings were created by Imperial Toys in 1986 as part of their large Garbage Pail Kids-related toy line. Fashion Rings were available to consumers in two different ways. They were sold individually from a box as pictured here, or they also came as part of the Jewelry Sets. The box is rather simple in design and features a perforated top (designed similar to the Wax Pack boxes) intended to be 'popped-up' for countertop display. Inside the box is a thin piece of foam, with slits cut to hold the rings. Each box contains six dozen rings. These Fashion Ring boxes are extremely rare and rarely show up for sale. 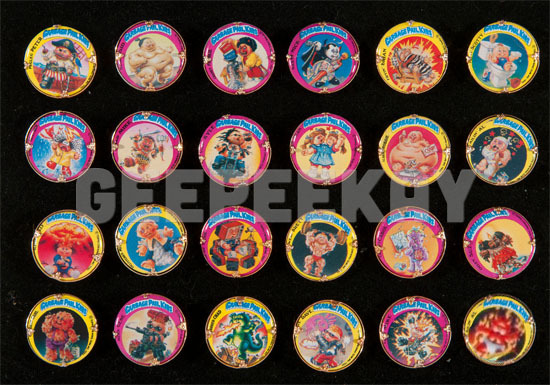 As stated above there are a total of 24 different character rings available. 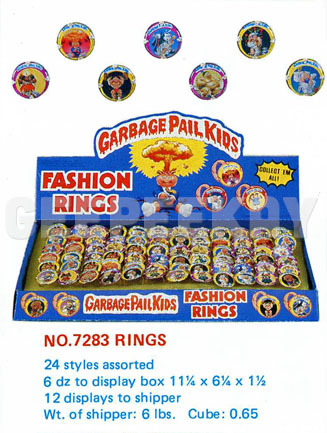 The image below contains ALL 24 variations that were distributed in either the Fashion Rings box or the Jewelry Sets.